Diabolical Dynamics was the 2001 game for the FIRST Robotics Competition. The playing field is a carpeted, rectangular area. Dividing the field in half is an 18 in (457 mm) high railing with a central bridge, which can tilt to either side of the field or remain level.Two 7 ft (2 m) high movable goals begin on opposite sides of the field. Around the perimeter of the field are two stations for human players, who work with remote controlled robots on the field to score points. At the start of each match, the alliance station contains twenty small balls. An additional twenty small balls and four large balls are located at the far end of the playing field. Each match is a maximum of two minutes long. Alliances can end the match at any time. 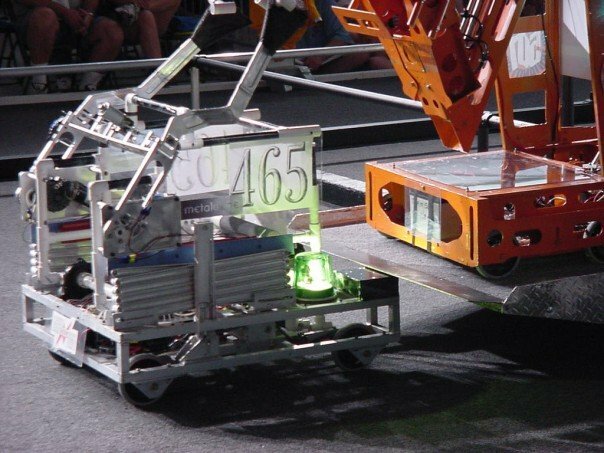 Alliances score one point for each small ball in the goal, ten points for each large ball in the goal, ten points for each robot in the End Zone, and ten points if the stretcher is in the End Zone. The alliance doubles its score for each goal that is on the bridge if the bridge is balanced, and multiplies its score by a factor of up to three by ending the match before the two minute time limit. Each team receives the alliance score. A team multiplies its score by 1.1 if its large ball is on top of a goal. Scores are rounded up to the nearest whole point after applying all multipliers.